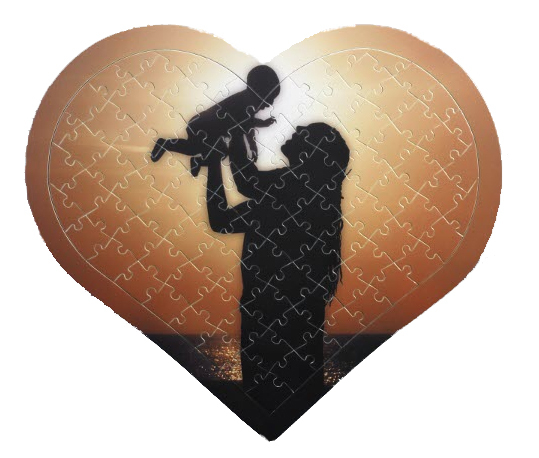 Personalised Full Colour Photo Heart Jigsaw Puzzle. The puzzle has 97 pieces and measures 11.5” x 13”. The puzzle has a high gloss finish and is made from cardboard. The puzzle pieces are surrounded by a boarder and have a back support that enables you to hang it from a wall as a picture puzzle or use as a stand. This is a great personalised gift to show off your amazing photos for Birthdays, Anniversaries, Valentine's Day, Weddings, Christmas…… it’s endless!